I love Britax’s line of strollers because they are full-featured, stylish and well priced. Now, my go-to recommendation – the B-Agile – is getting an upgrade in the form of the B-Free. Designed for kids from birth to 65lbs, the B-Free is the perfect option for parents who want a ‘one and done’ solution. From birth parents can use the stroller as a travel system by attaching their car seat to the frame. 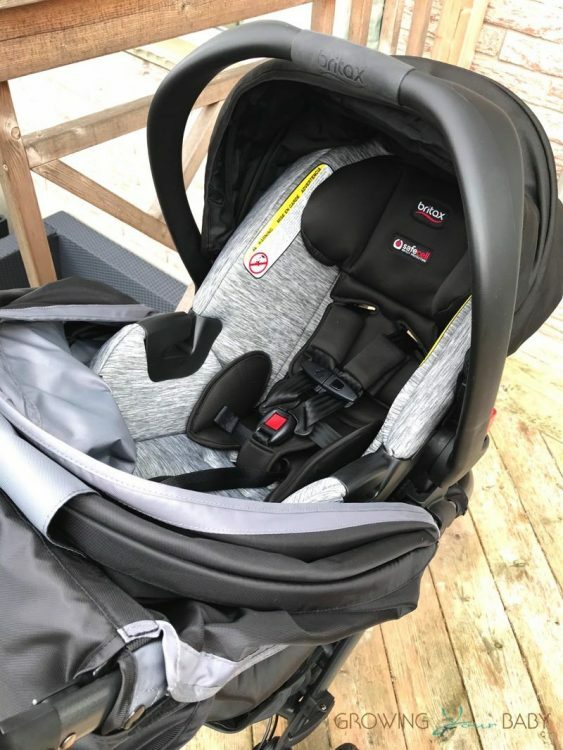 The B-Free comes with an adapter for Britax’s B-Safe infant seats but it can also be used with many other popular car seats on the market. New for Britax, the infant seat can be positioned facing you or facing out. I don’t personally recommend this for newborns but you can turn them around as they get older and need a change of scenery. Also from birth parents can use the seat in the flat-lying positon. 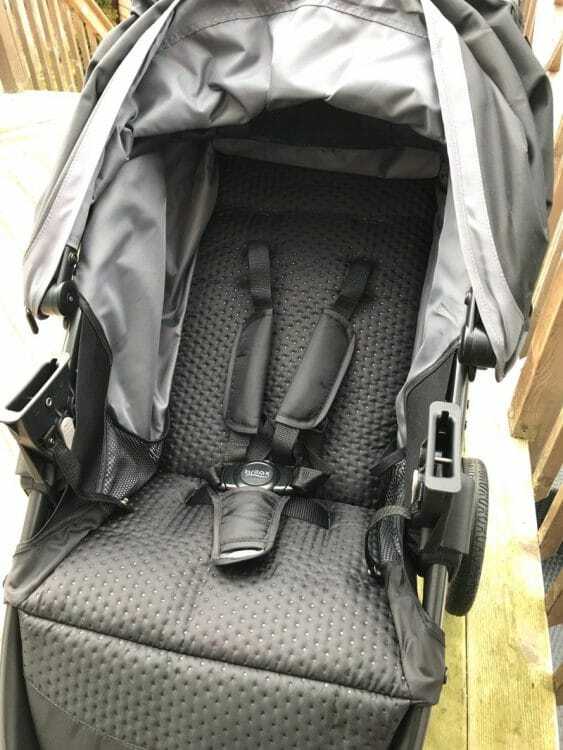 The stroller seat comes with a 3 height position adjustable 5-point harness to keep your little one in place and a quilted backing to keep them comfy. The B-Free also has pockets in the seat for your child to keep their snacks or toys close. The lever on the back allows parents to adjust the seat to any height. The flap over back can be rolled up to move air through the mesh panel on the back of the seat as well. When we tested the 2016 B-Agile one of the things I wasn’t fond of was the footwell. Designed to be more ergonomic, it didn’t leave enough of a ‘well’ for kids to be able to rest their feet comfortably. 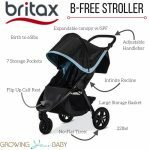 I am happy Britax chose to add this back in when they were creating the B-Free because it offers kids a better strolling experience. As a bonus, Britax added a hidden pocket underneath for parents to store their phone or extra supplies while out. 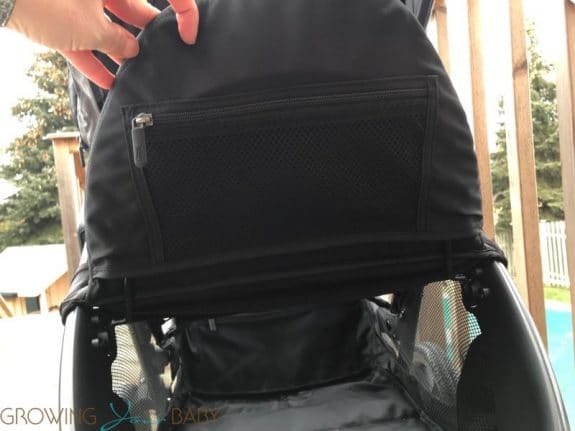 The B-Free actually comes with 7 pockets which are nice for a long day out traveling or to the park where you need to pack a lot and want to stay organized. 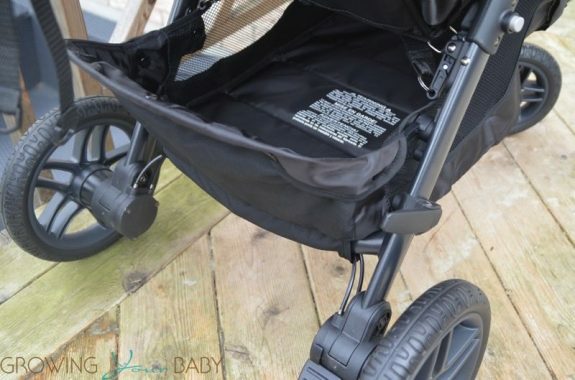 The canopy on the B-Free is the robust, full coverage we have come to expect from Britax. It is now in a stronger winter jacket like material and comes with a peekaboo window with magnetic closures. 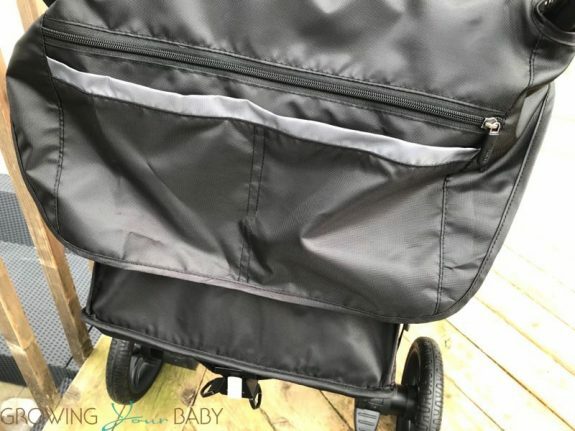 On the back of the stroller, there are 3 pockets(1 zip and 2 open) you can use to store additional items. The handlebar on the B-Free is more reinforced and adjustable for parents of different heights. 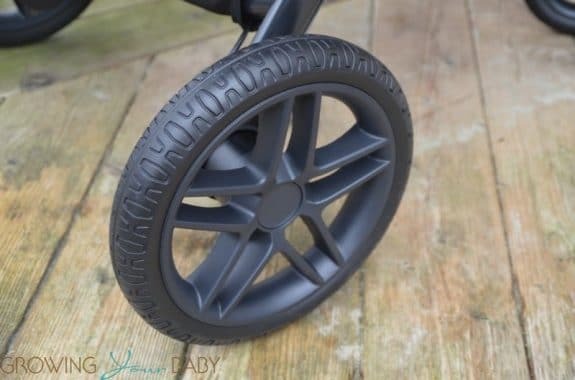 On this stroller, Britax uses all-terrain rubber tires so you’ll never worry about a flat. The tires are larger than the ones we’ve seen on the B-Agile so they can handle rougher terrains. I personally like a 3-wheel configuration on a travel stroller because it allows you to maneuver through busier areas easily. The storage on the B-Free is much bigger than the B-Agile and there are – you guessed it – MORE pockets. Easier to access, there is a spring-loaded bar on the back to allow you load your gear into the back. 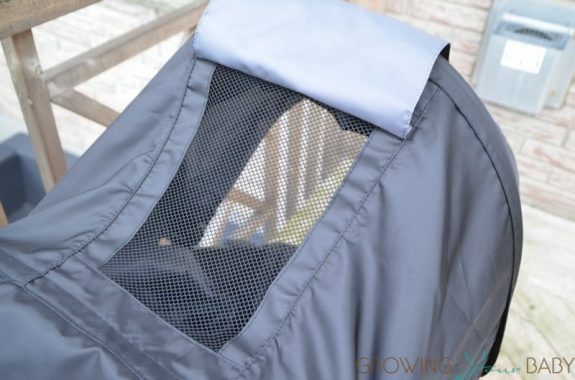 Britax has also added mesh up the sides to ensure nothing falls out. The additional pocket is hidden along the back of the storage basket and have zippers to ensure everything stays in place. When you’re ready to store your stroller the fold is a quick two-step process that is easy for anyone to master. Just press the grey button on the side and pull the lever on the seat up and the whole thing folds in half. 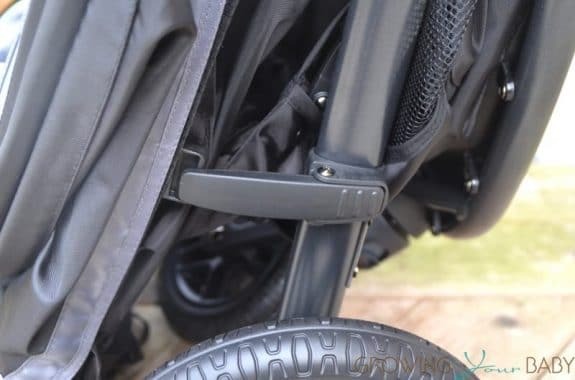 Flip the handle up before you fold it and the stroller will stand on its own! A frame lock keeps everything closed during storage. I love all the upgrade Britax has added to the B-Free. 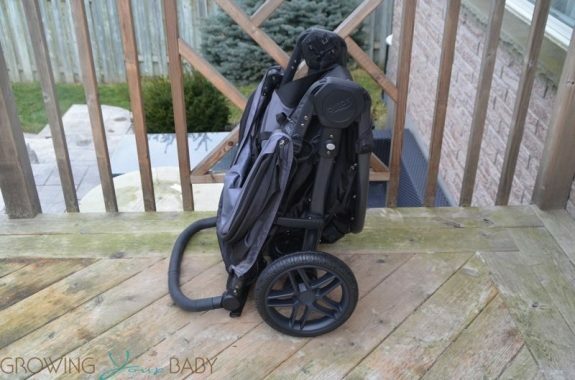 It truly is a great stroller that accomodates all situations. Whether you are a condo dweller who is low on space or a suburban mom who is constantly on-the-go, it conforms to all lifestyles.